From a diet standpoint, I have been a very bad girl the last two or three weeks. No way am I approaching a scale for another couple until I have mended my wicked, fattening ways. I may simply mend my ways and just avoid the scale until fall. In any event, I have vowed to create some dishes that are high on flavor and low in fat and calories. For some reason, when I woke up this morning, I was thinking about soup. God knows why–its July. But I was thinking that something light with veggies and beans would be the ticket. And then I remembered the turkey sausage in the freezer and I had a plan. I can’t say that this in any way resembles a traditional minestrone. I’m not sure what makes minestrone what it is. But I always remember a sort of tomatoey based soup with beans and pasta and other veggies. So that’s what I did, except instead of the traditional Italian white beans, I used the last of the lentils I had floating around. Lentils are something I always buy and rarely do anything with. Not sure why. I just find them generally uninspiring. They have very little flavor on their own, I suppose. But in this case, that’s a good thing because they take on the flavor of the stock and the wine and the sausage and the lovely trifecta of onion, celery, and carrot. The end result was a lovely, light and flavorful soup that’s perfect for lunch or a light supper (and also an entry for Kahakai Kitchen’s Souper Sunday) that comes in at 4 servings for 281 calories and 4 grams of fat. Update: I checked out Wikipedia’s explanation for what makes minestrone what it is. Minestrone (Italian: minestra (soup) + -one (augmentative suffix) hence “the big soup”, the one with many ingredients) is the name for a variety of thick Italian soups made with vegetables, often with the addition of pasta or rice. Common ingredients include beans, onions, celery, carrots, stock, and tomatoes. There is no set recipe for minestrone, since it is usually made out of whatever vegetables are in season. It can be vegetarian, contain meat, or contain a meat-based broth (such as chicken stock). Brown the sausage over medium heat. When the sausage is about half cooked, add the onion, carrot, and celery and saute briefly until sausage is completely cooked. Add this mixture to the crock pot. Add the garlic and dried lentils. Add the stock, wine, and water. Add the pizza sauce (or tomato paste or sauce–whatever you’ve got) and stir well. Throw in the pasta shells at the last minute and allow to cook until softened. Kelly of Evil Shenanigans is hooking us up this week with a fabulous, fall apart in your mouth, grandma style pot roast. You cannot beat pot roast. I know this was always the Company Dinner when I was growing up. This looks fabulous Kel. Looks delicious! 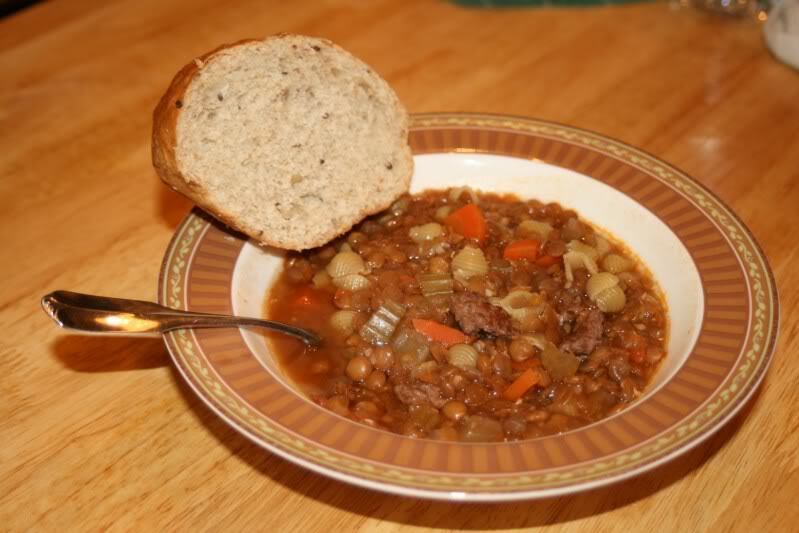 I love lentils in my soup and turkey sausage makes everything yummy. Thanks for sending it along to Souper Sundays! Stopping by from souper Sunday, this looks great! Soup in July? I was thinking the same thing, but it just seemed right.